(CBS/KPHO) GLENDALE, Ariz. - Glendale police will begin to search a landfill Monday morning in hopes of finding Jhessye Shockley's remains. 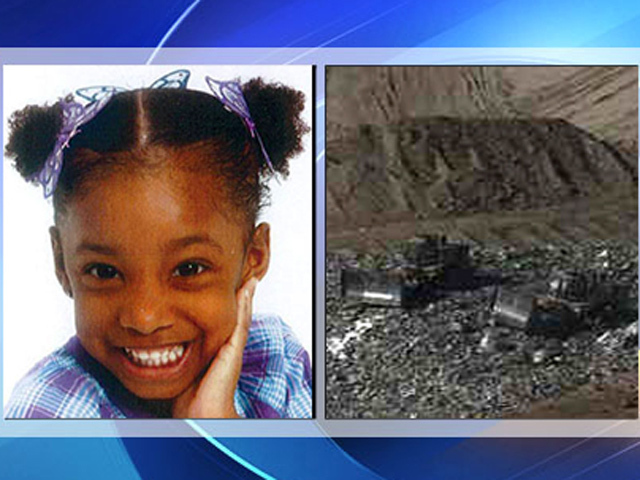 The 5-year-old girl was reported missing Oct. 11, 2011. Police believe her body was disposed of in a trash bin which was then deposited in a landfill. "We want nothing more than to find Jhessye and hold the person who is responsible for her death accountable," police Chief Steve Conrad said. "I feel we owe that to her, her family and the community." CBS affiliate KPHO reports more than 40 people, including the FBI and the child Abduction Response Team will search through 6,000 tons of trash. It could take six weeks, police said. Authorities unsuccessfully searched the same landfill for two bodies in the 1990s, but they are more hopeful this time. "The technology that's in place right now puts us into a better position to be successful than in landfill efforts in the past just because we are in a position where there's much more scientific analysis that's able to be done in this particular situation," said Sgt. Brent Coombs of the Glendale Police Department. The search teams will comb through the landfill for eight hours a day, Monday through Friday, Coombs said. Coombs said there remains potential for finding a body with "punctures, scratches, lacerations," and that the technology also can find things emitting gasses, "which is why we have hazardous materials (team) here monitoring the area." Police have narrowed the search to a specific area of the landfill, and are confident Jhessye's body was dumped in that location. "We know a specific date that we believe the body was removed from the apartment, made its way over to a trash receptacle, then removed on a specific day by a specific truck, went to a transfer station, was picked up by another specific truck and went to a specific location within the landfill," said Coombs. Jhessye's mother, Jerice Hunter, remains the primary focus in their investigation into how the girl disappeared, police said.